Mar 15, 2016 • [Source: Jon Campbell, U.S. Geological Survey] The U.S. Geological Survey and the European Space Agency (ESA) have established an innovative partnership to enable USGS storage and redistribution of Earth observation data acquired by Copernicus program satellites. The ESA-USGS collaboration will serve scientific and commercial customers who are interested in the current conditions of forests, crops, and water bodies across large regions and in the longer term environmental condition of the Earth. Data acquired by the European Union’s Sentinel-2A satellite launched in June 2015 are highly complementary to data acquired by USGS/NASA Landsat satellites since 1972. The agreement is part of a broader understanding between the European Union and three U.S. federal science agencies — NASA, the National Oceanic and Atmospheric Administration (NOAA), and USGS — that was signed in October 2015. All parties are committed to the principle of full, free and open access to Earth observation satellite data produced by the European Union’s Sentinel program and by the respective U.S. agencies. An ESA article further describes the cross-Atlantic collaboration. Sentinel data are available at no cost from the Copernicus Scientific Data Hub. Additionally, in order to expedite data delivery around the globe, users may also download both Sentinel-2 and Landsat data at no charge in a familiar digital environment from USGS access systems such as EarthExplorer. Presently, only selected Sentinel data are available from the USGS in an early testing phase. Timely access to all Sentinel data will follow as the procedures for data transfer, user access, and data delivery continue to be optimized at the USGS Earth Resources Observation and Science (EROS) Center. 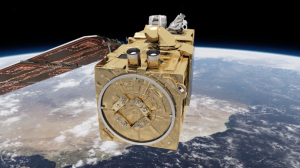 The MultiSpectral Instrument (MSI) sensor on board Sentinel 2A acquires 13 spectral bands that parallel and contrast to data acquired by the USGS Landsat 8 Operational Land Imager (OLI) and Landsat 7 Enhanced Thematic Mapper Plus (ETM+). Unlike the Sentinel-2 satellites, Landsat satellites also include a capability to collect thermal infrared data which is used in a variety of water and agricultural monitoring applications. NASA has published an online comparison of Sentinel-2A and Landsat bandwidths. For technical details such as data availability, geographic coverage, acquisition frequency, and resolution, visit the Copernicus and Landsat websites. The Landsat program is a joint effort of USGS and NASA. First launched by NASA in 1972, the Landsat series of satellites has produced the longest, continuous record of Earth’s land surface as seen from space. Landsat data were made available to all users free of charge by the U.S. Department of the Interior and USGS in 2008.